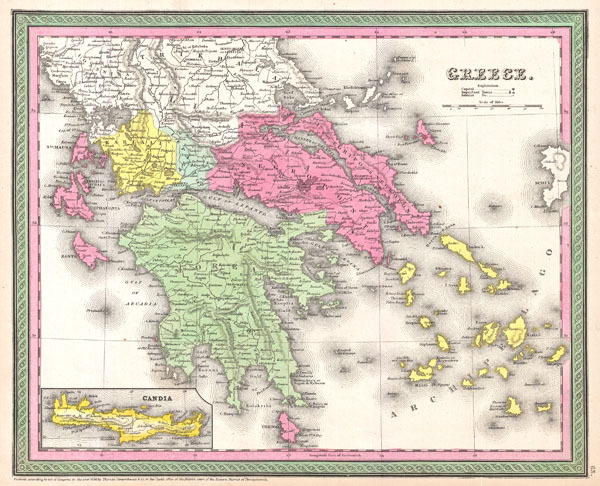 An extremely attractive example of S. A. Mitchell Sr.'s 1853 map of Greece. Covers from Ioannina and Triekhala south to include the Euboea (Negropont) and the Peloponnese (Morea). Color coded according to region. An inset map in the lower left quadrant details Candia or the island of Crete. Surrounded by the green border common to Mitchell maps from the 1850s. Prepared by S. A. Mitchell for issued as plate no. 63 in the 1853 edition of his New Universal Atlas. Rumsey 0537.062 (1846 edition). Phillips (Atlases) 6103-61.